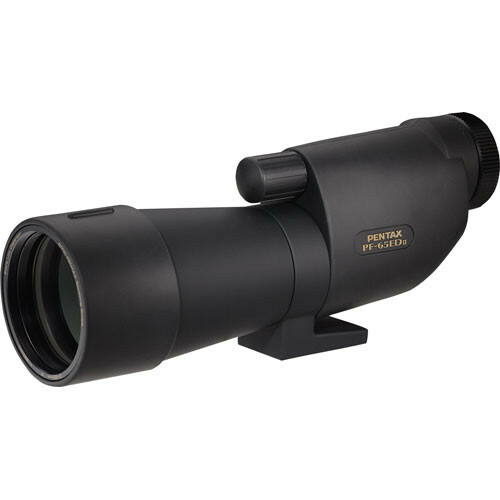 The Pentax PF-65ED II Scope Body is designed for high-precision outdoor viewing. It has been improved over its predecessor by further minimizing color aberrations, resulting in truer colors. These scopes use 1.25 diameter eyepieces, which allow less compacting of the light shaft produced by the objective lens and thus a larger image with superior depth perception. This is a great feature, for in addition to the brilliant offerings from Pentax themselves it also means you can use the best of astronomy eyepieces from elite telescope manufacturers such as Meade, Celestron and of course the venerable Tele Vues. The PF-65ED II has a focal length of 390mm, so if you're using conventional 1.25" eyepieces you divide 390mm by the focal length of your eyepiece to determine the effective magnification. Pentax ED scopes function brilliantly in many conditions of light and climate, and are remarkably light thanks to their metallic alloy housing. Pentax's scopes are available in either a straight viewing or angled viewing depending upon your needs. This is a personal preference which, cannot easily be defined for you until firsthand experience, but the conventional thinking is that the scopes with straight viewing are simpler for locating your subject.